If you want to read about me finally making it out to run on day 3 of Janathon you’d better go away now and come back tomorrow. I Wouldn’t want you to waste time reading any more of my ramblings and excuses if you’re not a hardened Janathoner or don’t want to. I had every intention that I was going to run today. I got up and put on my running kit. I’m still in it. Things just didn’t go to plan. I was up by 8am moving the remainder of the furniture upstairs or to the garage. All ready by 9am for the carpet fitters to arrive and once sorted I could work out where to take myself off for a run. Fitters arrived at 12 after a phone call or two to find out we were not first call of the day as promised. The rain also arrived at midday with some wind and a generous helping of hail and at times a hint of sunshine before a rumble of thunder and flash of lightening. I gave up. Saturday will have to be my Janathon running debut. 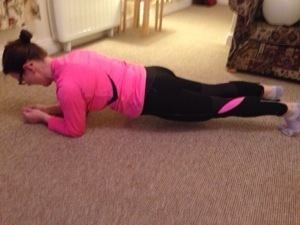 I did do a nice Janathon plank on my new carpet. Categories: Janathon | Tags: excuses, plank | Permalink. I was a lot less keen to lie on the old filthy one! Excellent hi-viz planking — safety first! Nice carpet too. Love your running kit. Well done planking long enough to have a photograph taken. I’d have crumbled as it clicked! Nice plank form. Nice carpet too! Works for me; this is what Janathon is all about!